Another request for a cake to look like a real object! Only this time, it’s a fish!! As I wasn’t about to bring in a real live fish as my model, a print out of a salmon will have to do! I ‘scale’ (no pun intended – lol) the print out of the fish to the size I want to do the cake. I then use this as my template to cut out layers of cake from a full sized sheet cake. After stacking the cake and giving it a crumb coat with buttercream I put it in the fridge to let it set. The crumb coat is to keep the cake crumbs from mixing in with my final buttercream layer. Once this thin layer of buttercream is cold I can finish masking the cake in buttercream. It goes back in the fridge to set, once again. For this particular cake, I choose to cover it in modelling chocolate instead of fondant. I did this because I like the way modelling chocolate blends together and can be textured. This helps when I add the fins and tail, also made from modelling chocolate and when I create the fish scales using the back end of a piping tip. I started with plain ivory modelling chocolate as the fish has a sort of gradient colouration from the top to the bottom and I can easily achieve this by using edible coloured dusts. Oh! Did I foget to mention that this cake was for Canada’s very own Levi Bent-Lee?!! Happy Birthday Levi! 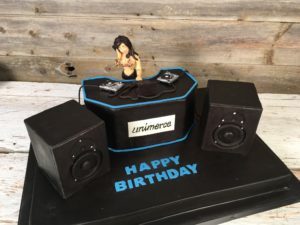 In addition to being surprised with this cake for his birthday, Levi is also a client our ours having ordered a birthday cake for his girlfriend, Mercedes (aka DJ Unimerce).